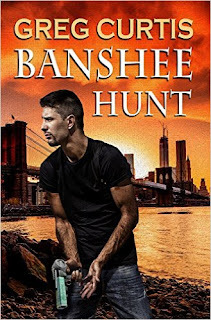 Banshee Hunt by Greg Curtis. James Henderson was once a proud cop. A detective. A husband and father. But then the world of magic came tearing into his world and that life ended. Now five years on he's a hunter. Tasked with tracking down rogue witches and wizards for the Illuminati. It's not the job he dreamed of. It's not the life he loved. His co-workers don't respect him. He's forever in trouble with his bosses. They even tried to take away his Sig and give him a magical toy gun! But it's a job and he's good at it. Then the banshee entered his life, and his world was turned upside down once again. Suddenly he had a whole new problem. And a question to answer. For those of you who follow this site will know that Greg Curtis is one of my favourite authors. I've probably read most of his books and each one was just as good as the previous. And so I didn't hesitate to buy his latest work titled Banshee Hunt. The story follows James Henderson who was once a cop until his daughter get's kidnapped. He learns to his horror that his brother was the culprit, and can control people's minds. From there James ends up becoming a bounty hunter for the supernatural world. He tracks down and captures rogue supernatural beings. James Henderson, simply put, is my type of hero. I hate wishy-washy heroes who are indecisive and easily led by others. I prefer reading someone who knows what he wants to do, doesn't get beat up every time he's in a fight and is a bit of a loner. In terms of the storyline, I really enjoyed it and the plot moved at a natural pace filled with action and suspense. There was also significant characterisation of the hero which you could see from the start of the book to the end. It's been awhile since I read a book where I had to get to the end no matter what. Simply put, if you're a fan of urban fantasy, then give this book a try.